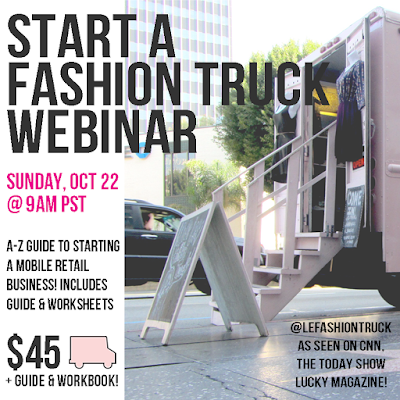 We're excited to be hosting another "Start a Fashion Truck" webinar! Join us on Sunday, October 22nd at 9am PST for our 1 1/2 hour webinar and learn the basics to starting your own mobile boutique or fashion truck. If you want to open a mobile retail business but don't know where to start, then this is the perfect webinar for you! Collectively we have almost 15 years experience in mobile retail: from the start-up phase to the day-to-day operations, we are leading experts in the mobile retail industry. Our experience includes starting and operating our own fashion truck as well as consulting other small businesses and larger corporate brands. October's LIVE webinar gives you all the necessary tools, tips and tricks to starting a store on wheels on a realistic budget and through do-it-yourself practices. Learn about writing a business plan, obtaining business licenses and permits, startup costs, monthly budgets, finding and flipping the truck or trailer, effective POS systems, day-to-day operations and helpful tips. We'll also throw in an extensive summary guide and workbook to guide you along the way. Le Fashion Truck and American Mobile Retail Association are the original creators of webinars focused on the mobile retail business industry. The "How to Launch a Mobile Retail Business" webinar first launched in 2011 and in 2016 we introduced the shorter version, "Start a Fashion Truck." We have assisted over 1,000 aspiring entrepreneurs in opening a mobile retail business from coast to coast!